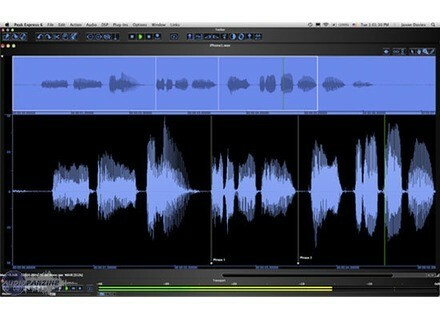 Peak Express 6, Digital Audio Editor from BIAS. 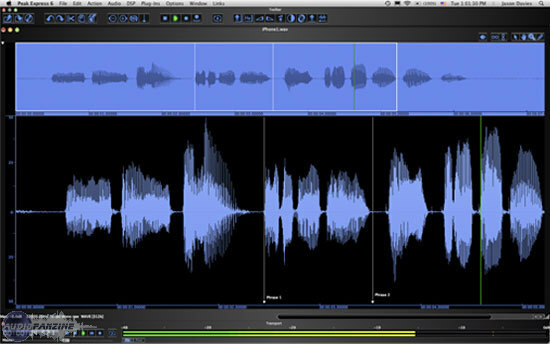 Berkley Integrated Audio Software (BIAS) has announced Peak Express 6, a major upgrade to the streamlined edition of its audio editor for Mac. Previously only available as an OEM edition, Peak Express 6 adds significant features, including integration with the newly released BIAS iProRecorder — a high-quality and intuitive general purpose recording application for iPhone and iPod touch. In addition to direct file transfer support from iProRecorder, Peak Express 6 offers essential audio importing, recording, editing and processing options for both the casual and more serious audiophile. Peak Express 6 opens most popular file formats, including AIFF, .WAV, SDII, MP3, MP2, QuickTime, AAC, and FLAC. Peak Express 6 can also import entire tracks, or selected portions, directly from CDs, making it easy to create custom mixes or sound collages from existing content. Editing features such as cut, copy, paste and crop, are included, along with processing options such as normalization, sample rate conversion, adjustable gain, and fades. Even an intuitive pencil tool for manual repair of digital clicks is included with Peak Express 6 as well as audio looping, custom location reference markers, and more. Peak Express 6 supports and includes dozens of Audio Units and VST effects plug-ins — from simple tone control to reverb, delay, and more exotic effects. Whether used to improve a voiceover for a Podcast episode, corporate training video, DV soundtrack, lecture, sermon, or home media project, adding effects is easy with Peak Express, and users can always expand their options as needed. For example, SoundSoap can be added for specific tasks such as noise reduction and auto click & crackle repair - essential for vinyl LP restoration or reducing background noise — and other plug-ins from BIAS and third parties are also available. Peak Express 6 saves audio files in most popular formats, but files can also be sent directly from Peak Express to iTunes for easy transfer to an iPod. Users can select whether to let iTunes handle the encoding, send the file uncompressed, or use different encoders within Peak Express 6 prior to sending. Metadata editing is also supported and ID3 tags featuring artist, album, genre, and more can be added prior to export from Peak Express 6. Peak Express 6 is available now from the BIAS web site for the special introductory price of $39.95. iProRecorder, the audio recording application for the iPhone and iPod Touch is available from the Apple iTunes App Store for 99 cents for limited time. Odo Synths 38911 Bytes [Freeware] Odo Synths has released version 2.0 of 38911 Bytes, the free synthesizer based on Commodore 64 software.